With the Chicago Comic & Entertainment Expo just days away we here at Idol Threat thought it'd be good to highlight the the events AFTER the event - of course we're talking about the after parties! As a rule girls are a scarce in the nerd world and geek girls are even scarcer. That's why a group like Sugar Gamers, brought together as an organization for female video gamers, is a boon to both genders of the geek community! You can find them at Booth 1550 but you can also PARTY with them at Sakura Karaoke Lounge on 234 W Cermak Rd in Chicago (a block away from the Chinatown-Cermak Redline stop) from 8pm-12am Saturday night! The event is 21+ and costs $10, but your first 2 drinks are included in the cost! Also present will be Chicago's premier event photographers ACTION BOOTH! This is an elite event and only 100 tickets will be sold, it's guest list only so RSVP is a MUST! Next up is an after party brought to you by the combined efforts of The Chicago Nerd Social Club, The Nerdologues and the Chicago Game Lovers Meetup Group! Join others in some Board Games run by the Chicago Game Lovers Group or groove to the music provided by DJ Aaron Ackerson! There will also be Nerdy themed drink specials and performances by: RAKS Geek, The Improvised Star Trek, Plan 9 Burlesque, Shock T’s and The Nerdologues performing Nerds Against Humanity with the creators of Cards Against Humanity! If you're coming from out of town and drop them a line ahead of time they'll even introduce you to some people! This event will be at 6pm at the Public House Theatre on 3974 N. Clark St in Chicago, tix will be $17 in advance and $20 at the door! If you'd rather immerse yourself in art Friday night then Nerd City's Art Luau is for you! It will feature artists Jim Mahfood, David Mack, Dave Crosland, Ben Templesmith, Joey Potts and Won Kim with a must-see performance by the amazing Adira Amram and the Experience who is fresh off her international tour with turntablist Kid Koala! Please note that this event replaces their Arcadia Insania party that would have been on Saturday night. You can visit Nerd City at Booth 967 and you can attend their event on Friday night from 8pm to 2am at the Volcano Room at the Bottom Lounge on 1375 W Lake St in Chicago. This event will be $20. Catch the Nerd City Panel on Saturday at C2E2 where they will be screening Jim Mahfood's D.I.S.C.O. DESTROYER coming soon to MTV's Liquid Television. 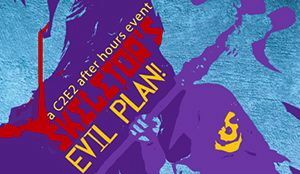 Finally we have a Friday night event hosted by Cosplay Chicago and the scourge of Eternia himself, SKELETOR! This shindig will feature music from nerdcore artist The Starship, fire and knife act Dollface, metal guitar duo Viking Jesus, indie rock trio Fantastic Mammals and The Glitter Guild burlesque show! This will be hosted at Reggie's Rock Club who will also be on hand at McCormick Center at 8pm on Friday to provide a FREE RIDE to their venue!!! Doors open at 9pm and it is $10 or $15 at the door (Though Reggie's ticket prices have been known to vary at the day of the show.) They are located on 2105 South State Street in Chicago a block away from the Chinatown/Cermak Redline stop. The Comic Book Legal Defense Fund has been helping comic artists with their legal needs and fighting censorship since 1986! Threadless is a Chicago-based tshirt & print company who sources their designs from a vast community of artists and was founded in 2000. Together they've teamed up to provide a special C2E2 after party on Saturday night. Be at Threadless HQ on 1260 W. Madison Street, Chicago at 8pm for raffles, beer and live music including a performance from Chicago's own Showyousuck and Auggie the 9th! You can visit CBLDF booth 837 and Threadless at 1054. This is a 21+ event with a suggested $10 donation. Get ready for a unique dining experience at Little Goat (820 W Randolph St, Chicago) Girl & the Goat’s newest offshoot! The restaurant is owned by Chef Stephanie Izard, 2011 Food & Wine Best New Chef, James Beard Award nominee and Top Chef Season Four winner. On Friday at 8pm you have the opportunity to actually HAVE DINNER with Bruce Boxleitner (TRON), Mira Furlan (Babylon 5), Brian Azzarello (100 Bullets), Jill Thompson (Scary Godmother), Tom Brevoort (Marvel Editor) and C.B. Cebulski (Marvel writer and talent scout.) Tickets are a whopping $325 and are on sale until Wednesday night. No matter which event you choose you'll be sure to have a blast, as long as you're not too tired from all the convention floor walking and bent-over browsing! No matter what we all know this will probably be the most exercise and socializing us nerds will get all year so we might as well go all out! C2E2 will be held at the McCormick Center in Chicago from Friday April 26 - Sunday April 28th.